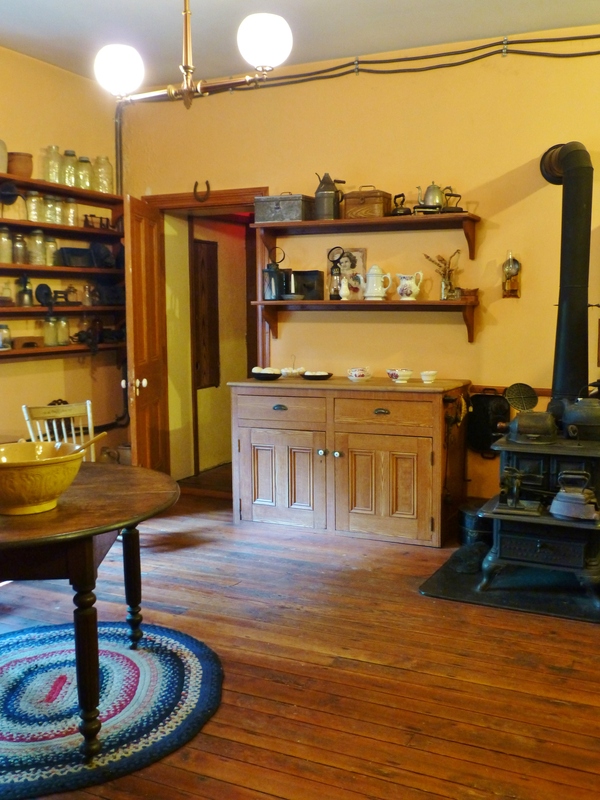 Can you picture yourself cooking in this historic 19th century kitchen? I picture myself less as a servant in the kitchen and more as a lady being served in the formal dining room…a girl can dream, right?! Well, here we are with my Fifth and final post on the Interiors at the Victorian Ebenezer Maxwell Mansion in Philadelphia, PA. I hope you’ve been enjoying this peek inside the life of the Victorian suburban middle class. 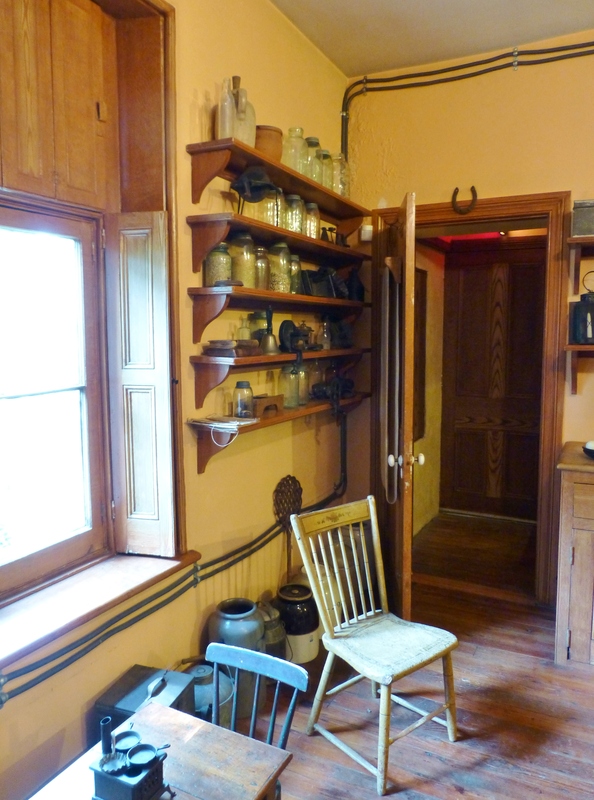 This last post focuses on the kitchen area of the Ebenezer Maxwell mansion, where the real work took place, behind the scenes. 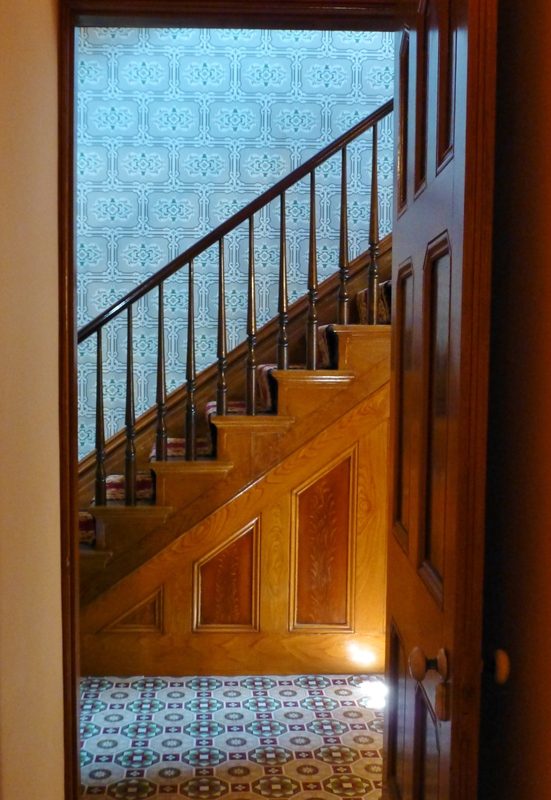 A long hallway leads from the Entry Foyer, between the Study and Dining room, and ends up in the Kitchen. 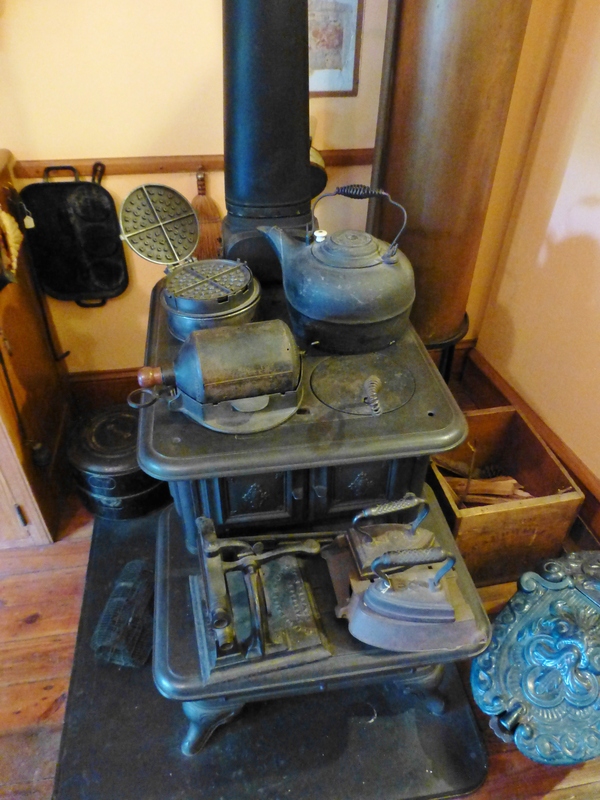 Upon entering the kitchen, the first thing you notice is the large black iron stove…I’m sure it got a lot of use, since the house was often very full, with 10-11 persons living there at one time! 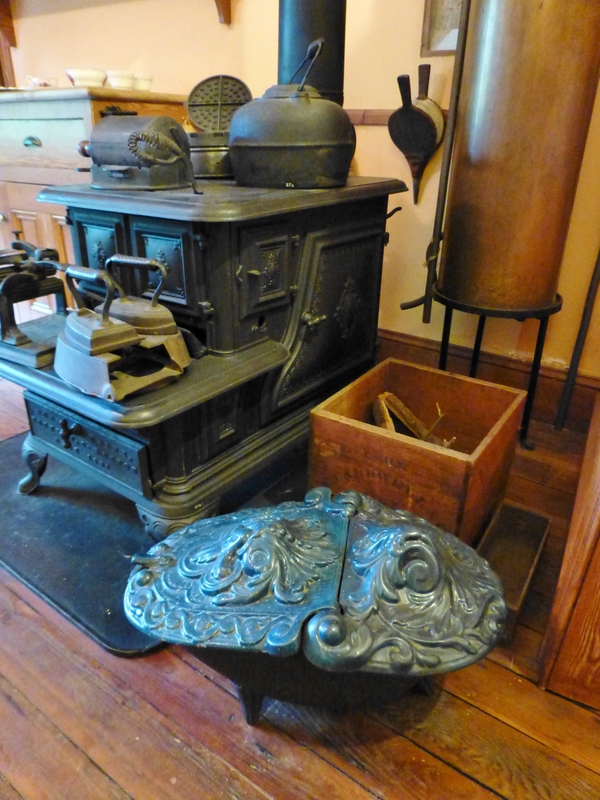 Here’s a detail of the sturdy black iron stove, topped with many Victorian kitchen accoutrements. Isn’t the coal scuttle at the bottom of this image pretty? I love the deeply embossed, scrolled decorative lid. I think it’s wonderful that the Victorians embellished even the most basic and utilitarian items in the home. Behind the coal scuttle, you’ll notice the large hot water tank…this was high-tech gadgetry for the Victorians! Notice the tubes attached along the ceiling and down below the window. These are the hot water lines, leading from the water tank (with water heated by the iron stove) and over to the sink. If you turn around and look back towards the hallway, you’ll see the sturdy kitchen table with useful shelving and cupboards on the wall above. Notice the cute little children’s table and chairs by the window. 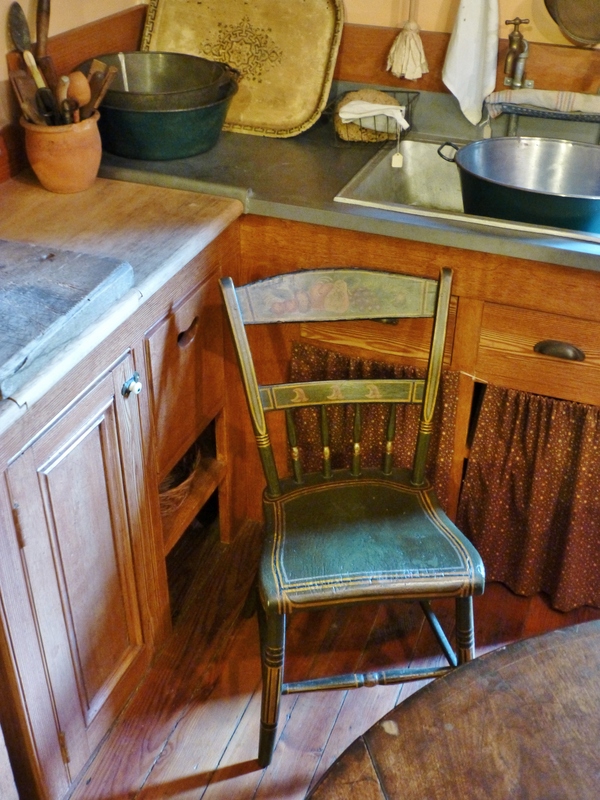 The kitchen actually had many modern conveniences, including a hot water heater and running water (you can see the sink to the right in this image). I love the green painted Hitchcock Chair in the corner–so quaint and charming! 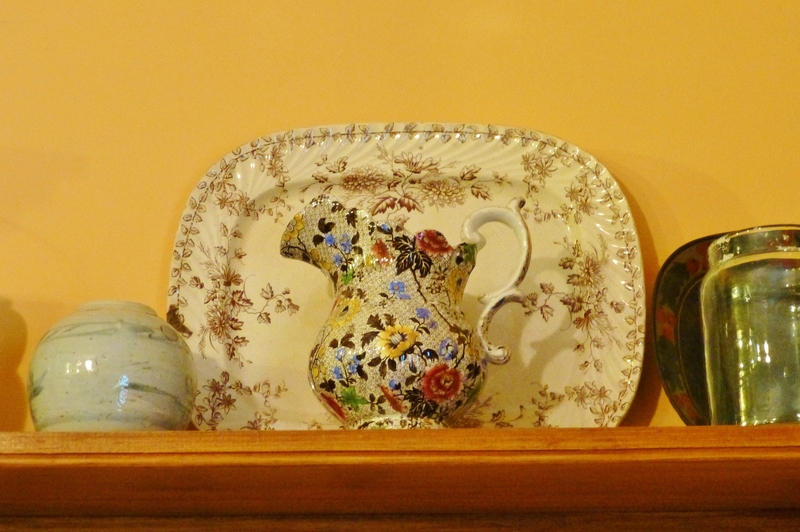 The open shelving contains many pretty and useful objects like the Stoneware platter and jug seen here. 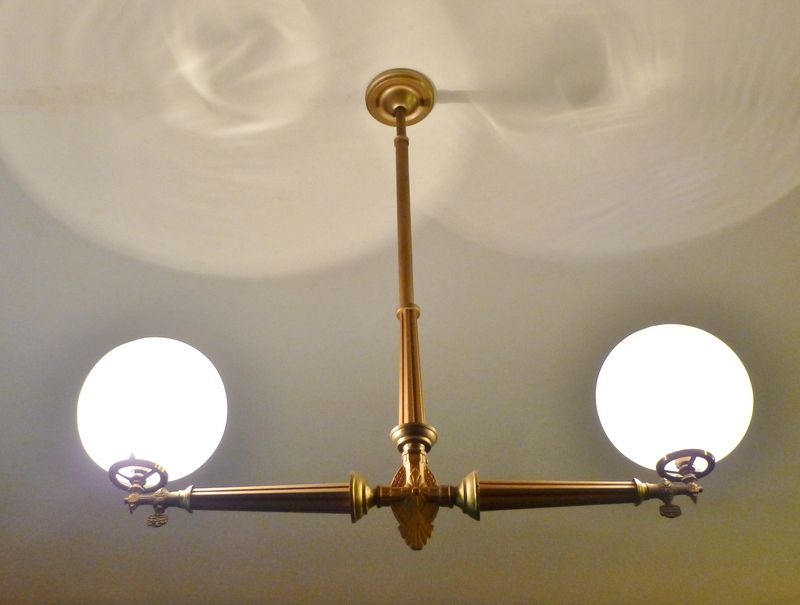 One of my favorite elements in the kitchen’s décor is this (formerly gas) light fixture. Isn’t it stunning? Can you see the valve keys just beneath the glass globes for adjusting the gas? 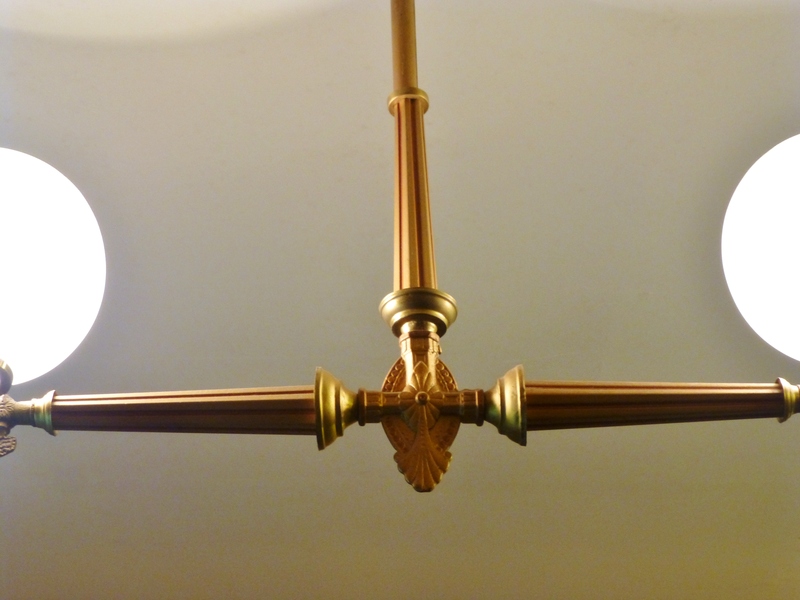 Here’s a closer look at the kitchen’s light fixture, and the beautiful starburst detail at the center. I could see this used in one of my client’s homes today, above a modern kitchen island. 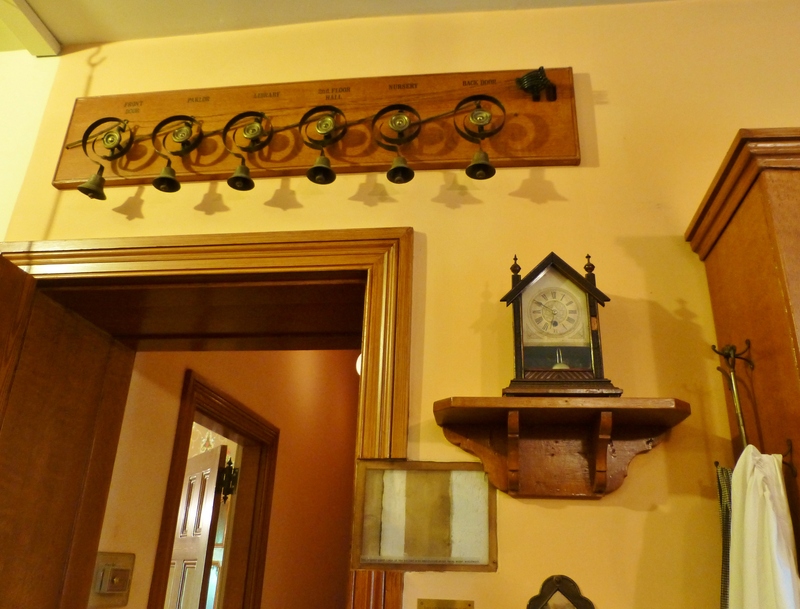 I just love this little steeple clock on a shelf in the kitchen–I collect antique clocks, myself, and this one is a beauty! Notice the very interesting device above the doorway to the hall: the servant call system, or house bells. 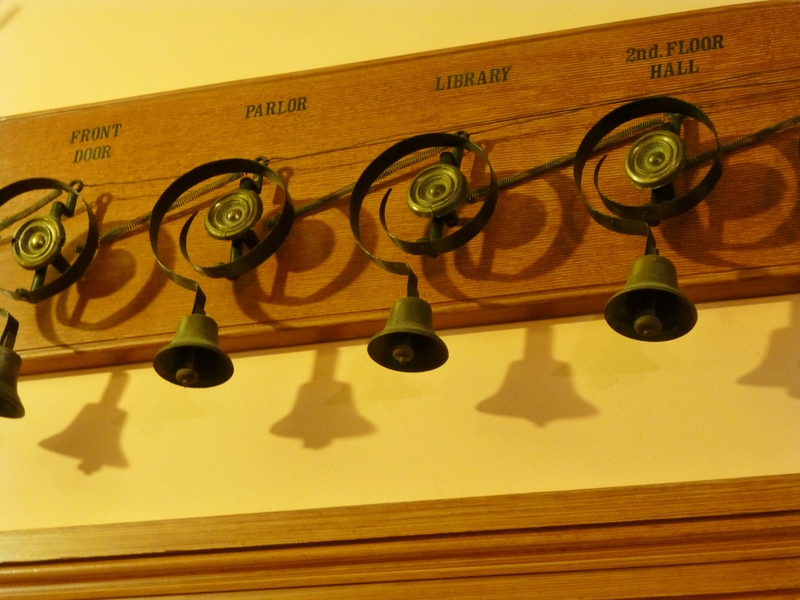 Each bell has an area labeled, so the servants could see the room from which the call was being made. Remember this image from the Study down the hall? It shows the crank for the call system. 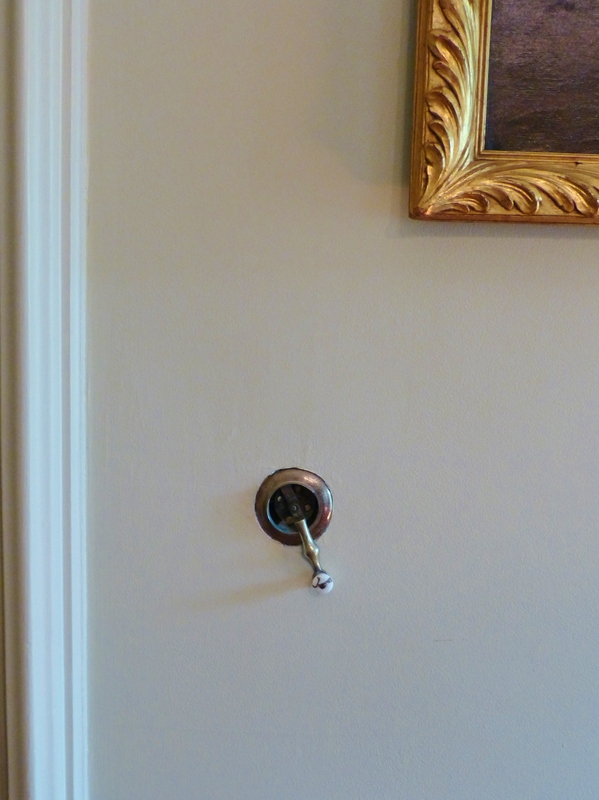 A simple turn of the handle would summon one of the three live-in domestic servants at the Ebenezer Maxwell Mansion. Don’t forget, the Ebenezer Maxwell Mansion frequently hosts a wonderful ‘Upstairs Downstairs’ event, which showcases the challenges and enjoyments of Victorian women across all socio-economic levels. 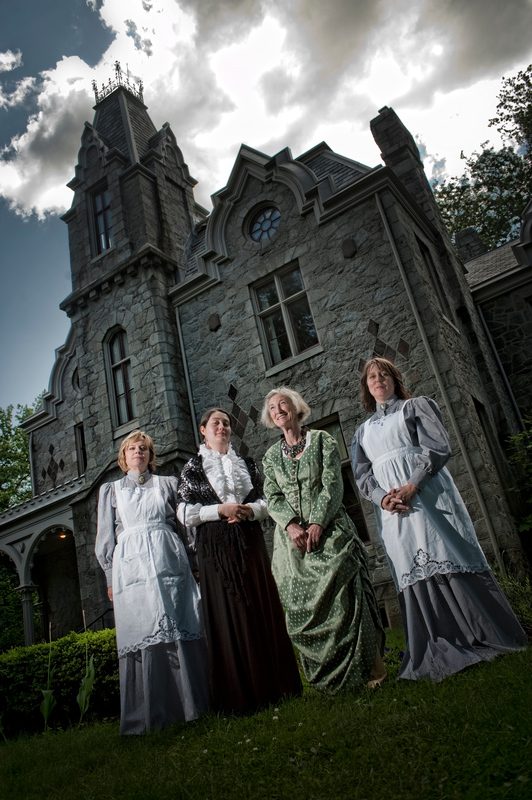 Actresses portray a Victorian lady and a maid, who guide visitors through the mansion, sharing their stories about life in the Victorian era. Well, that about wraps it up for my exclusive tour of the Ebenezer Maxwell Mansion. Please post your comments telling me what you think about these Victorian rooms. 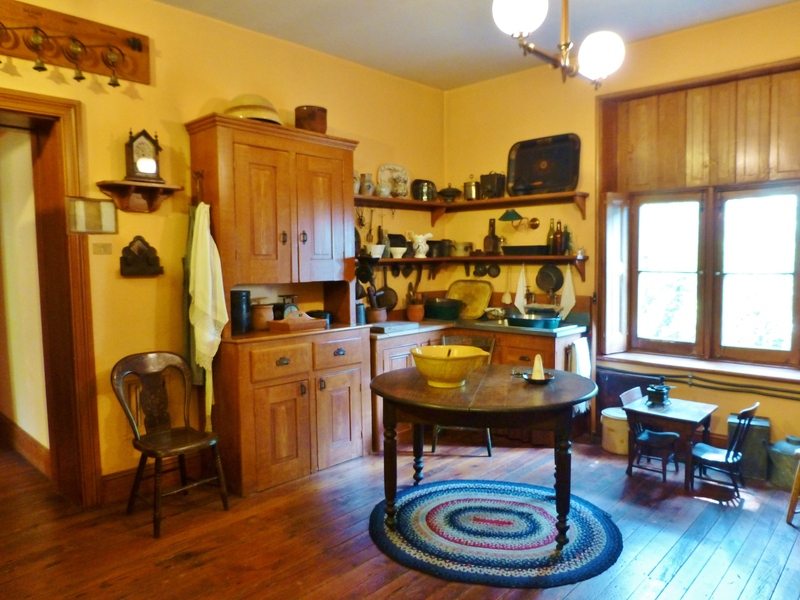 Can you picture yourself cooking in this historic 19th century kitchen? I picture myself less as a servant in the kitchen and more as a lady being served in the formal dining room…a girl can dream, right?! Next time, I think we’ll go back to the 2014 Mansion in May designer house….there are so many gorgeous designer rooms I haven’t shown you yet. I can’t wait to hear what you think about them! Until then, I always love to hear from you, and I’m even more happy if you share my blog and tell your friends about me…I need all the friends I can get! This entry was posted in Antiques, Historic Sites, Home Decor, Mansion, Victorian and tagged Call Bells, Chandelier, Decor, Ebenezer Maxwell, Furniture, House Bells, Interior, Kitchen, Philadelphia, Robinson interiors, Servants, Upstairs Downstairs. Bookmark the permalink. This was a great tour! I noticed in one of the pictures by the kitchen sink there were tea towels or linens with price tags dangling off of them, are people able to purchase items there when visiting the mansion? Just curious! 🙂 This was a nice walk back in time for sure! Wow such a neat historic tour! Makes me really think about all the home advancements just in these past few decades, thanks so much for sharing! Thanks for visiting my blog! I totally agree…it’s amazing what was considered ‘high tech’ 150 years ago. What fun to take a look at the past!